The word chutney derives from Sanskrit and means "to lick" the first Indian chutneys being sweetened with honey and thus being more runny they were served as a dip rather than a condiment. Chutneys can be dated as far back as 500 BC and their ingredients are now almost limitless. Early globalisation ensued as their popularity spread along the trade routes driven first by the Romans and then much later spread through out the English speaking world via the British Empire. As new foods poured in from around the planet, the Americas in particular and sugar was substituted for honey the recipe format was adapted and expanded to include exotic ingredients such as chillies and tomatoes. 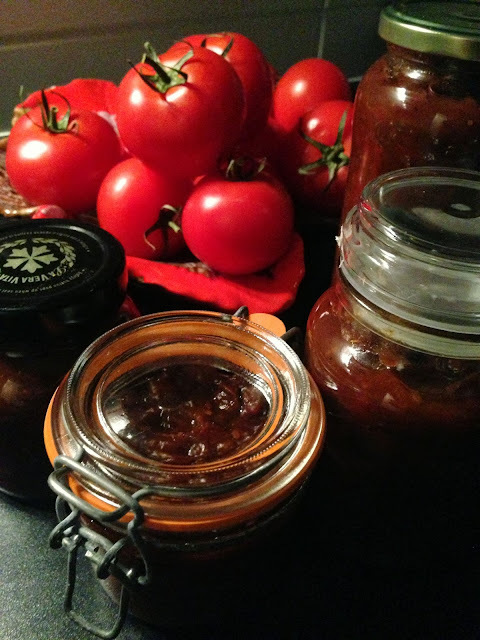 In Europe the preservative qualities of sugar, vinegar and salt were quickly realised and pickling and making chutney became an invaluable and tasty means of keeping fruit and vegetables edible over the cold winter months. Blend garlic and ginger to paste and chop the tomatoes into cubes and tip all ingredients into a large heavy bottomed pan and bring to a gentle simmer stirring frequently for one hour until mixture turns dark and jammy. Allow to cool and bottle and seal after a day or two. The chutney will keep well but once opened store in the fridge and use within a month.